What we are proud of…. I am Aries! I had a sister named Hope but she moved on to be with our ancestors some time ago. Now it is just me and my pack-mate Lazarus. We love to hang out in the shade and boy do we love visitors. If it is really hot outside in the summertime I love to dunk my front paws straight into my fresh water buckets when the volunteers come to clean them and fill them with cool water. Then they have to fill them again—it’s the most fun game! Come visit me on a Private Tour. I am Lazarus. My mom’s name was Lucky and I was born in the same litter as Lincoln, Lucas, Levi, and Lenape. When I was really little I got very sick with a respiratory infection and I had to be taken to the doctor. After I recovered I joined a new pack with Hope and Aries. Hope passed away some time ago, and now it is just me and Aries. Aries and I both love attention and food, especially deer meat! Come visit us on a private tour! I’m Dozer. I love, love, love to jump! I can jump up straight off the ground and I would probably reach right over the heads of my human caretakers. I grew up in a very small place and I don’t remember much about it but I am much happier here in my forest home with Ginny. We are both feisty and we love to play. Come see us on a private tour! Hi! I am Ginny. I came from New York City. Can you imagine me there? It was very scary for me. I now live in a big forest home with my friend Dozer. I have since learned to warm up to the humans. I am also a very good jumper! Sometimes I like to run and hide to escape Dozer when we play. You can tell who I am by my beautiful heart shaped markings on my face. Come visit me on a Private Tour! Hello there, I’m Rogue. 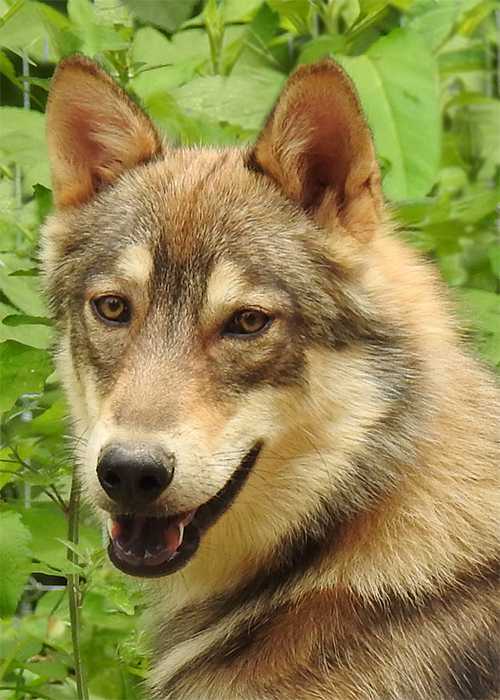 I’m a male wolf-dog and I used to live among humans but my human companion could no longer keep me. He was moving into a small apartment and just knew I would not be happy there. I need lots of room to run. When I came here they put me in a home that had this funny stuff I had to walk on. I finally had to ask the wolves in my pack what it was! They call it dirt and grass. I had never walked on such stuff, but I must admit it feels better on my paws. Now I have learned where to place my paws on the grass to be very quiet and sneaky, so when you come by my enclosure look hard cause I am here, you just might not hear me. Oh and I am told I have beautiful gray eyes. Come visit me on a tour! My name is Sky and I was born in August 2012. I love to run, eat and generally bug this big boy they roomed me with. His name is Rogue. He is quite handsome. I love to run with him and play and jump and roll around. He is older than me so I often jump and pounce a bit more than he does. I am happy to be here and out of that little box that mean man kept me in for most of my early puppy life. This place is so big I’m still amazed by it! I was so excited when I got to come down and see the other wolves. I love when humans come to visit me too! It’s great! Come visit me on a tour. I am Swayze. I tend to be shy, like my siblings. I’m also told that I am a very handsome wolf. I love to spend time with my family, walking our trails or napping in the afternoon shade. In the summer and fall I can be hard to spot, but I can always see what is going on from my hiding areas amongst the green. Come visit me on a tour soon! I am Cinderella and I was born here at the sanctuary. I love to dig dens. I especially love to take naps down in them when it gets very hot outside! I am very gentle when the volunteers feed me treats, and take them like a true lady. I hear them on the tours telling people that I was named after a very brave strong alpha female wolf named Cinderella who lived in the wild in a place they call Yellowstone. You’ll have to ask the volunteers the whole story when you visit, but all I know is that Cinderella rose up to challenge a very mean alpha who was threatening her pups. She survived and raised fifteen pups all in one den! Would you believe it? I always like to hear her story and I am honored to carry on her name. It must be fun to be in the wild, but I am so happy to live safely here in my forest home at the sanctuary with my family. Come visit me on a tour soon! Hi, my name’s Mika. I came from Virginia. I was so scared when I got to the sanctuary. I did not want anyone to touch me. They would come every day and sit in my house with me. No one forced me to do anything, they just sat with me. After a while I got the idea that I would sneak behind them and push them and run away. They did nothing but sit, not yelling at me or anything! I started feeling like I was safe, and that maybe I was going to like it here. And you know what? Now I love it here, and I love to run over and say hello when the humans come to see me. I even let them interact with me but always on my own terms, and that is how I like it. I live with my best friend Spirit in a large territory that we have all to ourselves. I have a big fluffy white coat that keeps me toasty in the winter and by summertime I shed it all right off as if I had a brand new haircut! That way I don’t get too hot on sunny summer days. I love to play and goof around. Come see me on a tour and maybe you’ll catch me and Spirit goofing around together! Hey, I’m Spirit. I live up on a big hill with my best friend Mika. Mika and I love to chase each other through the tunnels in our territory and we play all day long. I am very friendly because I used to live in Maryland with a very nice family who taught me it was okay to trust people. I still like it when humans come to see me, but I like playing with Mika even more! I’ve been told I have the most beautiful wolf eyes. Isn’t that just the nicest thing! Come visit me on a tour. Hello, my name is Tayha. 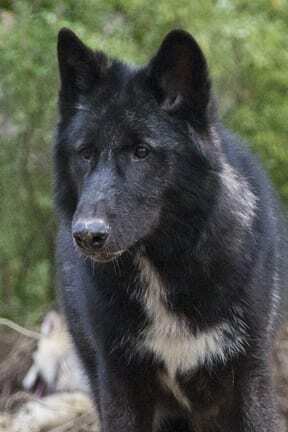 I am a shy female timber wolf. I have learned so much since being here at the sanctuary. I don’t remember much about my past, I still get a little bit stressed sometimes if I think about it too much and I start to pace. I’ve been able to move past that though since I’ve been in my new forest home with my best pal Sakima. We have so much space and there are so many fun places to hide. I’ve grown to trust people too, especially the ones that bring us juicy treats and raw meat for dinner. Come visit me on a Private Tour! 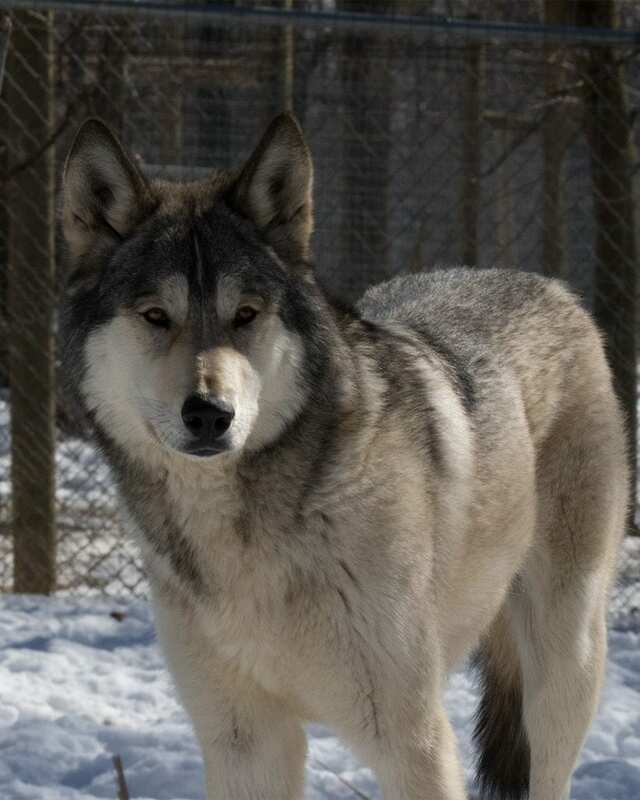 Hey, I’m Sakima and I am a timber wolf. 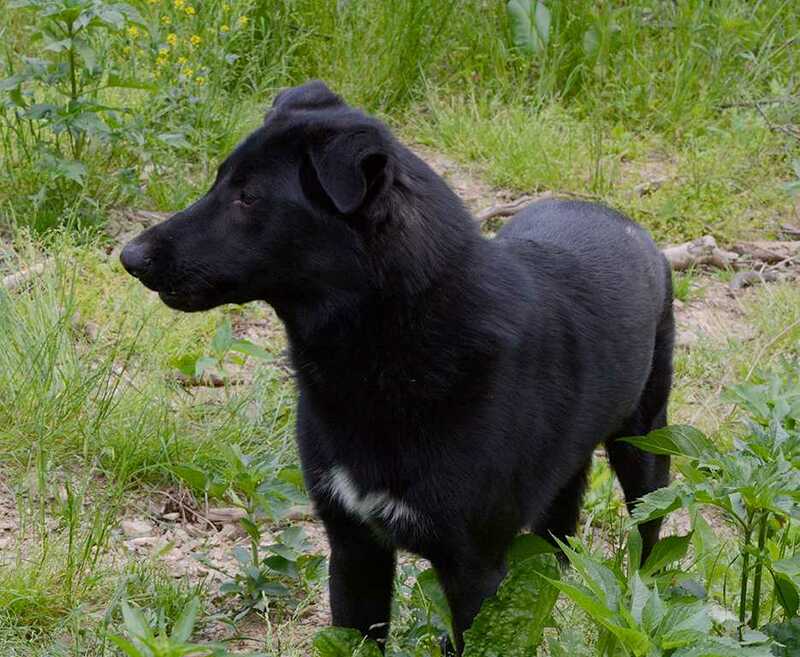 I was rescued and brought to the sanctuary with my best friend Tayha. She was a little bit nervous in the beginning but she’s gotten much better since we’ve been in our forest home. I was shy at first too but I’ve been warming up- everyone here is really nice! And they never say anything about my underbite—they say I am just as handsome as can be. Come visit me on a Private Tour! I am Lincoln. I love showing off! I like when people talk about me! I look a lot like my brothers but you can tell who I am when you visit because my tail is a bit shorter than theirs. Some of the volunteers call me an Alpha because I am the first to eat in my pack. I don’t always show all of the dominant traits, though, sometimes I let my brother Levi or our relative Frodo show dominance instead. Come for a tour to see for yourself and tell me what you think! I’m Sarge. I am a female in the big pack. I love being a part of a big family! There is always so much going on. When I howl with my pack I make as much noise as possible to make it sound like there are dozens of us. Come visit me on a tour and maybe you will hear me howl! I am Levi. I am the largest of the brothers. You can tell me apart because my nose has a bit more gray in it. I like to hang out and goof around with my family members Lincoln, Lucas, and Frodo. I am a strong wolf and I like to make the others submit to me. Come visit us on a tour soon! I am Chomp. I was named for my partially missing ear. I lost the tip in a scuffle with one of my pack mates. It happens, what can I say. I am the Omega female in my pack. I was born into the big pack and there is always something going on and I love to be a part of the action. Sometimes it gets me in trouble and I have to remember my place as a lower ranked pack member. We all have a role to play! Come visit me on a tour! I am Frodo. 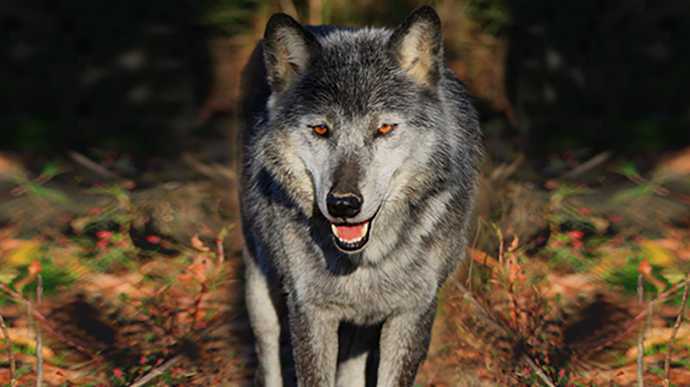 I am a large silvery male wolf in the big pack. Many people love to take my picture as I am so majestic! I love to play and run with the younger wolves in my pack, especially Lincoln, Levi, and Lucas. Come visit me on a tour! I am Lucas. I am very mischievous! My best buds are Lincoln, Levi, and Frodo, but I’m not quite as dominant as them. I love to run around my territory. Sometimes I am just a clown. Come visit me on a tour and see for yourself! Hi! I’m Shawnee! Oh boy am I excited to be here. I used to live in a house with some humans who I loved a whole lot but I am a very big female wolf and I outgrew their human lifestyle. I missed them when I first came here but I learned that the humans here are super nice too! I love when people come to visit. My pack-mate Kuzco is around my age and we are close to the same size so we just love to play. You may hear us howling from our forest hilltop, but the only way to see us is on a private tour! Hi! I’m Kuzco! I just love it here! Some people may think I look silly because of my ears but I have the spirit of the wolf in me and all I’ve ever wanted my whole life was another wolf companion to play with. Now I live in a big forest territory with my best friend, Shawnee! It takes me awhile to trust people sometimes, but once I trust you I’ll never forget you! Stop by to see us on a private tour – I’ll be the one with the floppy ears and long black tail! I am Achilles. I was just under 1 year old when I arrived. Battered but not broken, my will and my spirit remained intact. I had lived with a man who had no respect for any other, and I was in constant fear. I dreamed of a day when I would run free and wished to see my brothers and sisters again. My hope drained slowly as the days turned into months. Then one day while I was hiding in a corner unable to open my mouth because of a muzzle, my captors started to say something about having to hide me. Someone was coming to check the den and I could not be there when they arrived. Early in the morning the mate of the evil human wrapped me up and took me out of the den to hide me in another. There was noise outside and suddenly I was being brought back to that horrible place. But no, there were other humans in uniforms and someone else with the gentlest eyes and they were trained on me. I did not get to go with him at first. I was loaded in the back of a truck and spirited away. I was terrified. Where was I going and what was to become of me? I didn't know it then but I had just started my new life. I arrived at a place where they handled me ever so gently. My fear slipped away. Here I could tell everyone around me just wanted to heal me. I laid on the table still and quiet. I think I was in a bit of shock, maybe. They fixed my neck. I had a big hole in it where infection had set in. I had been beaten a lot at my home, and I ached all over. But the hands that touched me now meant no harm. I could feel the difference, and those gentle eyes were there to tell me it was all going to be okay. I was going home, a new home. When I got there I would not let anyone touch me at first. But they just sat in the same room with me, not making me do anything I did not want to do. Slowly I thought I would take that bit of food offered. Why not? I could hear off in the distance a familiar sound. A calling, but I was not sure. I did not want to get my hopes up. The gentle eyes came to visit me every day. I learned that this man was to be my care taker. He has always been very gentle with me. He reunited me with three of my siblings. I still recall the first day I saw them. WOW my heart soared. I was put in a small area right beside them and when the gentle eyes thought all was safe he opened the gate. He and his mate stood there with their breath held, as I bolted into my family’s home! I ran and ran -- the wind could not even catch me. I had never run before and what a feeling, and my family was there running too. Of course we had some tense moments as we got reacquainted. What family doesn't? I live with just two of my siblings now since our other sister lives in a different territory with her mate. I love my pack and we laugh and play and run and fight. We are a pack. We are proud and fierce and invincible! We are Wolf! I learned that is now my home, and I truly feel safe here. Oh and the gentle eyes still come to visit me, not as much as they used to. But then I have my family now, and there are new wolves to rescue and heal aren't there? Please help in our journey. Help the gentle eyes. Thank you for caring. Come visit me and my family on a Private Tour. I am Watonie. I am a female and the most timid member of my pack. I like to sit in the back and watch. I live with my two brothers, Running Bear and Achilles. Achilles was not rescued at the same time as us, and he doesn’t like to talk much about the time before he got to come to the sanctuary. I am so happy he is finally with us again! The three of us have the best time together. I am very shy around people at first, like my brother Running Bear, but once I build up trust I like to come a little closer to see what’s going on. Come visit me on a Private Tour. If you look closely, you might see me peering around a tree, but my markings help me blend in perfectly. I will be watching you even if you don't see me. I am Running Bear. I was rescued with two of my siblings, Yellow Feather and Watonie. Our brother Achilles was reunited with us later and we were so happy that he was saved from a horrible past. Now it is just Achilles, Watonie and me – Yellow Feather is with her mate Dakota on the other hillside. I am really quite shy at first, but over time I learn to trust some of my human caretakers if they are patient. I love to run and play with my family. People say I have the most beautiful markings on my face! Come visit me on a Private Tour. I am Running Bear. I was rescued with my siblings, Yellow Feather and Watonie. Our brother Achilles was reunited with us later and we were so happy that he was saved from a horrible past. Now it is just Achilles, Watonie and me – Yellow Feather lives on the other hillside but we still howl with her sometimes. I am really quite shy at first, but over time I learn to trust some of my human caretakers if they are patient. I love to run and play with my family. People say I have the most beautiful markings on my face! Come visit me on a Private Tour. I am Achilles. I was just under a year when I arrived. Battered but not broken. My will and my spirit remained intact. I lived with a man who had no respect for any other, and I was in constant fear. I dreamed of a day when I would run free and wished to see my brothers and sisters again. My hope draining slowly as the days turned into months, then one day while I was hiding in a corner unable to open my mouth. There was some kind of contraption on it. I learned that thing on my face was a muzzle. Anyway I digress, I was listening intently to what my captors were saying. Something about having to hide me. Someone was coming to check the den and I could not be there when they arrived. Early in the morning the mate of the evil human wrapped me up and took me out of the den and into another. There was noise outside and suddenly I was being brought back to that horrible place. But no, there were other humans in uniforms and someone else with the gentlest eyes and they were trained on me. I did not get to go with him at first. I was loaded in the back of a truck and spirited away. I was terrified. I already knew what horrors awaited be at my home, but what NOW! Where was I going and what was to become of me? I didn't know it then but I had just started my new life. I arrived at a place where they poked and prodded me, but ever so gently. My fear slipped away. Here I could tell everyone around me just wanted to heal me. I laid on the table still and quiet. I think I was in a bit of shock, maybe. They fixed my neck. I had a big hole in it where infection had set in. I had been beaten a lot at my home, and I ached all over. But the hands that touched me now meant no harm. I could feel the difference, and those gentle eyes were there to tell me it was all going to be okay. I was going home, a new home. I went to sleep, and when I woke up, well there was lots of fuss over me. I would not let anyone touch me at first. But they kept after me. Sitting in the same room with me, but not making me do anything I did not want to do. Slowly I thought I would take that bit of food offered. Why not? I could hear off in the distance a familiar sound. A calling, but I was not sure. I did not want to get my hopes up. The gentle eyes came to visit me every day. I learned that this man was to be my care taker. He has always been very gentle with me. He reunited me with three of my siblings. I still recall the first day I saw them. WOW my heart soared. I was put in a small area right beside them and when the gentle eyes thought all was safe he opened the gate. He and his mate stood there with their breath held, as I bolted into my family’s home! I ran and ran -- the wind could not even catch me. I had never run before and what a feeling. My family in my wake. Of course there have been tense moments as we got reacquainted. What family doesn't? I live with just two of my siblings now since our other sister lives in a different territory with her mate. I love my pack and we laugh and play and run and fight. We are a pack. We are proud and fierce and invincible! We are Wolf! I learned that is now my home, and I truly feel safe here. Oh and the gentle eyes still come to visit me, not as much as they used to. But then I have my family now, and there are new wolves to rescue and heal aren't there? Please help in our journey. Help the gentle eyes. Thank you for caring. Come visit me on a Private Tour. Hello there! My full name is Downingtown Dozer but you can call me D-Dozer if you like. The place I came from was in Downingtown, PA which is how I got my name! I am so happy to be here and have grass under my paws and trees to take naps under. I love romping and playing with my lady-wolf companion, Vada. Come visit us on a Private Tour! Hi! I'm Vada! 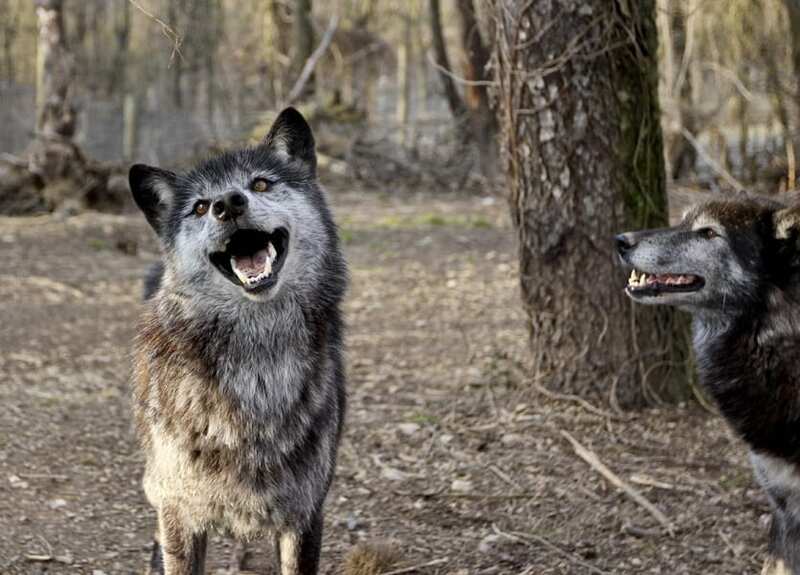 I am just the happiest wolf-dog around since I get to spend my days with my very best wolf-dog friend, Mr. D-Dozer. We romp and play in our forest territory. The best is when the humans come to bring us big juicy pieces of meat. We leap into the air for joy! Come visit us on a Private Tour! I am Yellow Feather, and I am an Alpha female. I was rescued from Elizabethtown along with my siblings Running Bear and Watonie. 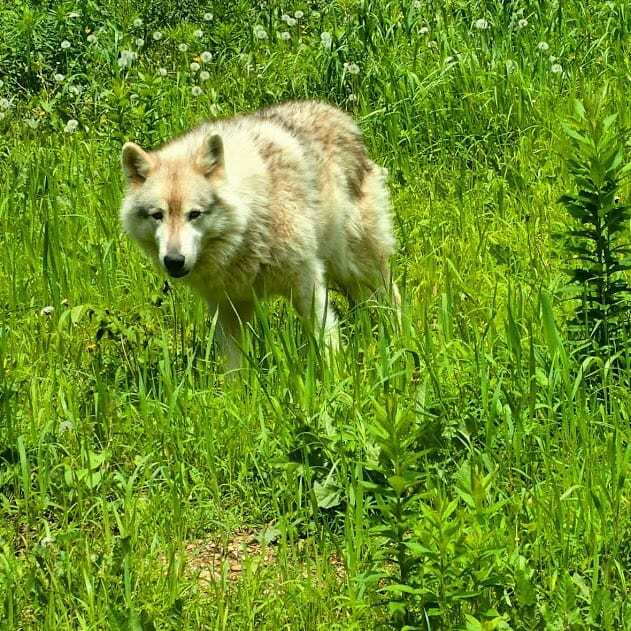 We lived together for awhile but then I met the most wonderful male wolf-dog named Dakota and we became an Alpha pair and moved into our own forest territory. Dakota passed away recently and I still miss him very much sometimes. I am still a little cautious around most humans, just being smart, I call it! Come visit me on a Private Tour. I may be a little shy but I will be watching for you. I am Sophie. I came from New York City with my friend Ginny, but Ginny I parted ways a few years back. For the last few years I lived with Bear, a handsome male wolf. I love to pounce around and try to get him to play. We had a great time running around our wooded area, but we especially loved to take long naps in the shade. Bear passed away recently and I do miss him very much sometimes. I just love living here! I also love attention and I am very smart. When I first got here I was very lonely. 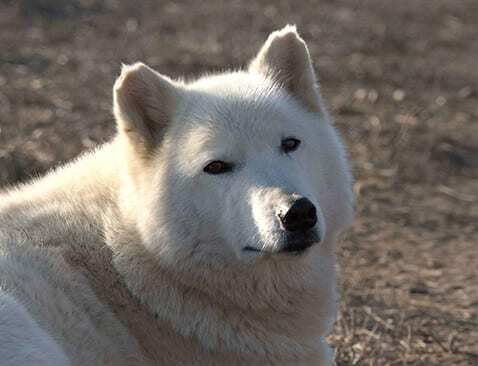 I wanted to be with other wolves or at least with one of these new humans but they said that for a little while I had to stay in a place called quarantine until I was ready to move. I decided I didn’t want to wait any longer so I chewed a hole in the door and they came and fixed it. Then I squiggled through the fence panel and the ceiling. They came and fixed that too. Then I found another weak spot and they even fixed that! Then I thought I will just chew a hole in the roof, and of course they fixed it. After awhile they put a new roof on and I was stuck. Arg! Little did I know I would not be in quarantine for very long. Before I knew it I was in a new enclosure with wolf friends and you know what? I never tried to escape again. We decided we no longer wanted to live together recently so the humans took me up to meet a new pack-mate. I think I kind of like her and I love to run around with my neighbors too! Come see us on a Private Tour! I’m Thor, and in case you didn’t notice, I am blind. It is because of cataracts. But don’t worry, it doesn’t bother me at all! My sense of smell and hearing are extra great to make up for it and I’ve made lots of trails for myself all over my forest territory. I can even sometimes sneak up on the volunteers without them knowing it! 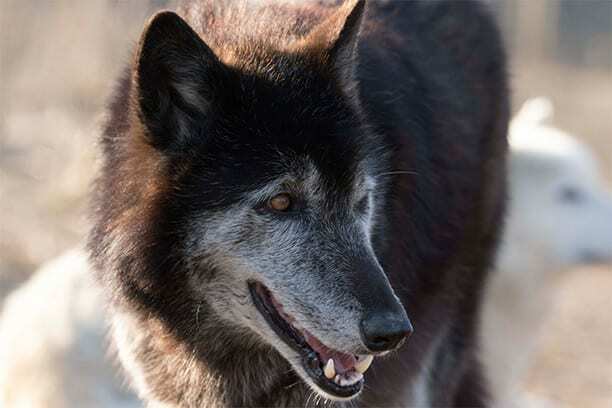 Imagine that—a blind wolf sneaking up on you! I love running along the fence! Oh, and of course I love treats! I lived with my mate Lucky for awhile but she passed on. I miss her very much and sometimes I howl for her. I like tours a lot because the visitors and volunteers keep me company! Come for a tour and spend some time with me! 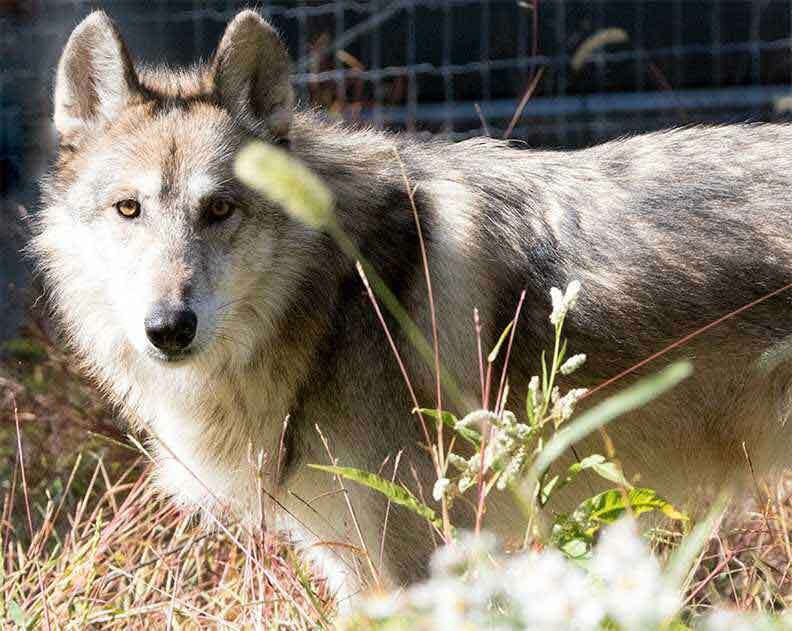 My name is Little Girl but I am not really sure why—I’m a big strong female timberwolf! I came to the Sanctuary from Missouri. 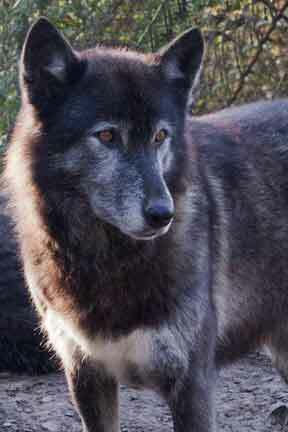 I used to live with a big strong male timberwolf named Tioga but he passed away. We had the most fun playing together, and I do miss him very much sometimes. Come visit me on a Private Tour and see how playful I can be! Hi, I’m Loci. Like Thor, I also can’t see very well. But that doesn’t stop me from anything. I definitely know my surroundings! I was rescued from Virginia. Now I live in my very own territory! I have a big pool that I like to splash and play in on hot days. Recently, I’ve been gaining a bit of my eyesight back—it’s not perfect yet but I’ve never seen a wolf wear glasses—have you? I get by perfectly fine with my nose and my ears. I have a GREAT sense of hearing and smell! Come visit me on a tour and see how I am doing! Hello, there. I am Anastasia. I am very shy – I am a wolf after all! I am still learning to trust humans so when people come to visit me I sometimes duck behind a bush and peer out to see who is there. I am learning to trust the people who come to care for me and bring me dinner. They bring juicy pieces of meat right on the bone – Yum! Come visit me on a Private Tour soon! You may not see me but I will be watching for you! I am Trinity. I always like to see what is going on. Right now I am by myself but the humans here come to visit me very often and bring me tasty treats and bones to munch on. The humans tell me that I will meet a new companion soon and I just can't wait. I am very motherly and I love to make sure everyone is well groomed and cared for. But don't be deceived - I am a very strong alpha when it comes to discipline. Hi! My name is Akela! I am a male wolf from Colorado. The humans I lived with before took good care of me but I wasn’t like the dogs they had – I’m a wolf after all! I love being around other wolves and playing and running along the fence with them. I lived with the most wonderful companion for awhile. Her name was Tala. She passed away recently and I do miss her very much sometimes. Come visit me on a tour soon. I will be keeping an eye out for you! Hey there! My name is Goose. Me and my brother Blue are timberwolves from Montana. We are a little shy but we like to watch the visitors when they come. Come for a Private Tour and see us standing on our hilltop. Hi, I'm Blue. I'm new around here and pretty shy. I came from Montana with my brother Goose. Come visit us on a Private Tour - keep an eye out for me in the distance - I'll be watching for you. Hi! I'm Luna Mishka! I am a very playful female wolf-dog. I love to romp around and play with sticks and bones and all kinds of natural toys! I also love to pounce around in my pond on hot days. Right now I have to go and finish a game of Hide and Seek with Kaya. Come visit us on a tour soon! Hello! My name is Kaya. I am a female wolf-dog and I'm still a little shy. I do love to pounce and play with my pack-mate Luna, though. Sometimes I sneak and steal one of Luna’s bones when she’s not looking then I hide it! It’s a really funny game. She always seems to find it again though. Come for a tour to see us soon! You know me as Galahad! I have to say I am not very shy and I love attention, but always on my own terms. What do you expect I am wolf, hear me howl! 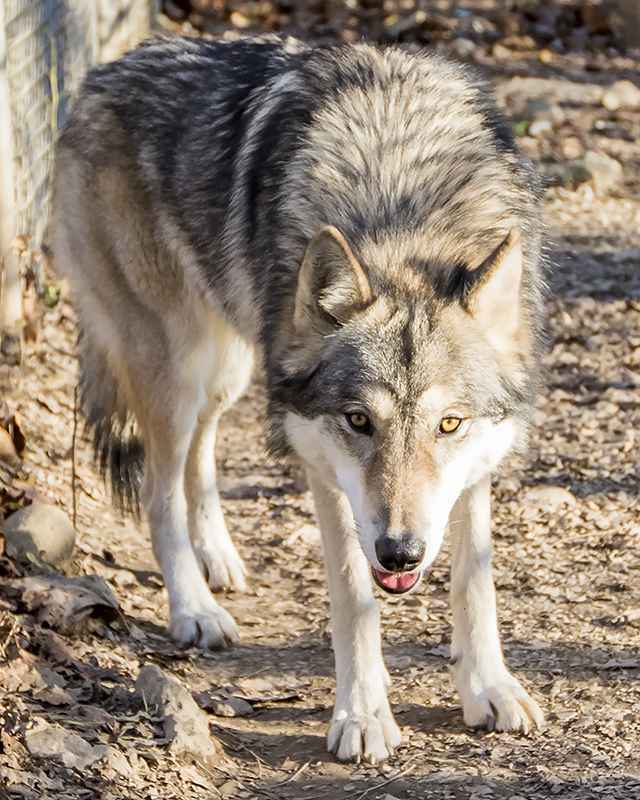 When you stop by my enclosure during your tour I may show off my wiggle and wag my tail – yes, we wolves do wag our tails when we are happy – and I am quite a happy wolf! Hello my name is Jake. I am a female wolf-dog. I moved around a bit before coming to the sanctuary but I am told this will be my forever home and I will never have to leave. I love to give a little howl when I see visitors. I am a little shy at first, but I do love my human caretakers who I have grown to trust and appreciate when they visit and just sit in my company. It settles my soul to have them near. I also love to spend time with my companion Galahad. We were neighbors for awhile but we now share a territory and we wouldn't have it any other way. Come visit us on a tour! Hello there, my name is Akira. I want to tell you right now that I am a prim and proper girl and I am thrilled to be here. I don’t have many fond memories from before I came here. There was a lot of mud and water and my fur was so covered in mud that you couldn’t see my beautiful coat. I am so so much happier now, I am all clean and healthy and I have a forest home where I can run and play. I also love to pounce and play with my pack-mate Kodie. He is much bigger than me but we just love to play together. Come visit us soon! Hi I’m Kodie. My full name is Kodiak but my friends call me Kodie so you can too. I have my very own territory with lots of grass and bushes and space to run around. I have explored every inch of it and now it all smells like me which makes me feel right at home. I’m very curious but I'm still a little nervous around new people. After awhile once I feel comfortable I love to pounce and play along the fence. Come visit me on a tour! Hello there! 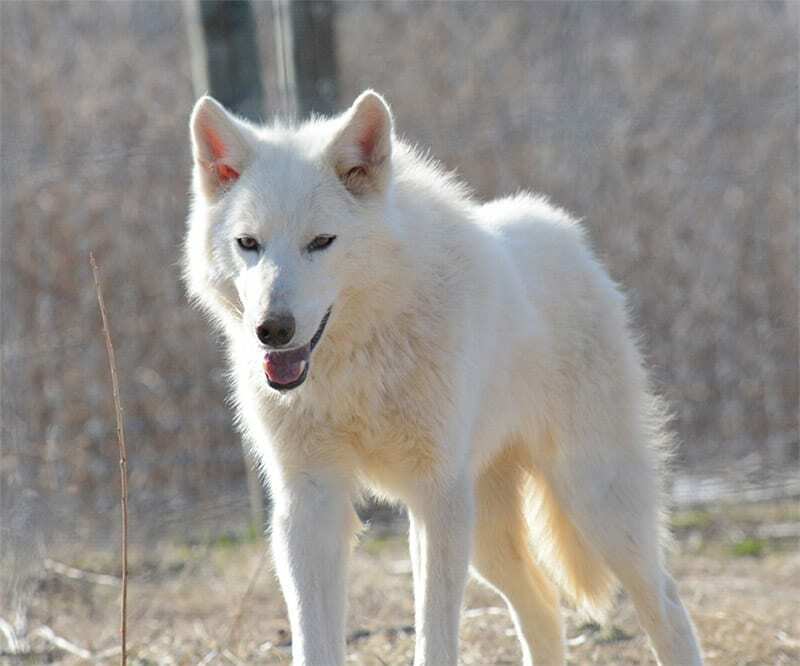 I am Shiloh and I am a young male wolf. I just love to nestle into a comfy spot with a nice crunchy stick or branch to munch on. I’m somewhat shy around my human caretakers, and I’m very shy of new experiences and unfamiliar humans but I do like to come to the fence and see what’s going on. Hi! I’m Vivian Laurel. I am a young female wolf and I am the leader of my pack! I am very dominant with my siblings and I make sure they know that I’m in charge. I love to play and romp around with them. When it comes to my human caretakers I’m super social and I love to spend time around them. I often melt into a puddle when they appear because I’m just so excited. I love to have attention all to myself! Hello there, my name is Hera. 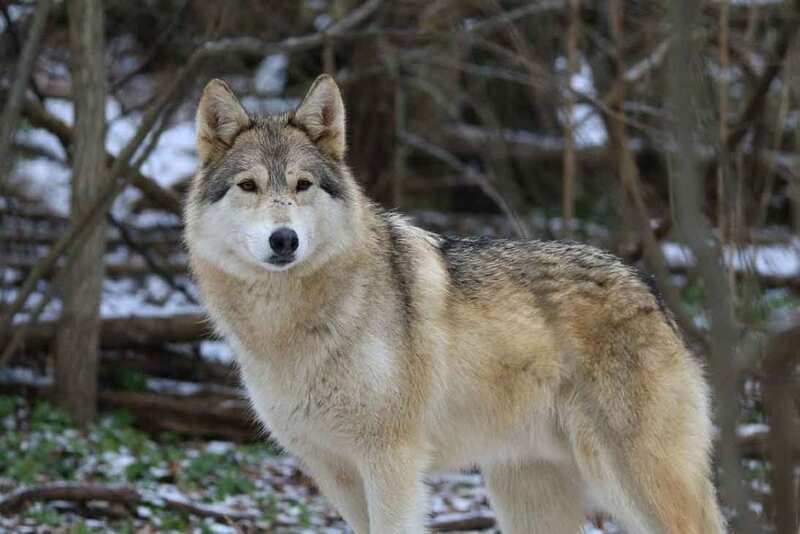 I am a young female wolf and I like to carry myself with a quiet elegance. Don’t let that fool you, though, I’m not submissive with my siblings. I will still stand my ground during playtime and protect my favorite bone or stick. I am very shy around humans though I’m happy to come to the fence to investigate. Hey! I’m Freya. 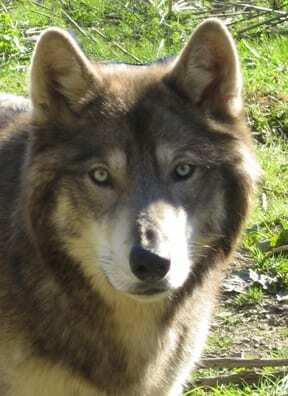 I’m a young female wolf and I am very adventurous and I’m always the first one to try new things. I love to swim in my pond and I’m very social with my human caretakers and I’m also very mischievous. Hello, I’m Fenrir, call me Fen for short. I am a young male wolf and I love to play but my very most favorite thing to do is to find a nice spot to nestle down and take a long nap. I love naps! I’m also very social with my human caretakers and I love to spend time around them too. Hi! 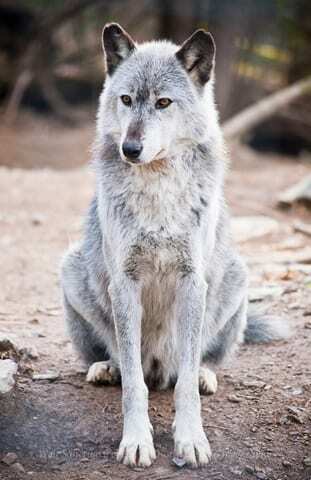 My name is Violet and I’m a young female wolf. I’m submissive around my siblings, I know they’re in charge and I’m happy to flop down and show my belly so they know I’m not challenging them. I’m very social with my human caretakers, but I’m quite cautious around new things. I love to play and I’m very energetic. Hi there, my name’s Cheyenne. I came from a place called New York. I used to have a lot of puppies back then but I never got to see any of them grow up, the humans would always take them away. I liked my humans well enough but I didn’t know what it was like to be free. Once I was rescued and brought to the sanctuary everything changed. Now I have my very own territory that I share with my wolf-dog friend named Yogi and we are free to do anything we like! I love when people come to see me! Come on a tour and visit us up on our beautiful hill! Hello! I’m Yogi! I am a young wolf-dog and I am super, super excited to be here! I came here when I was very little and oh boy I was beside myself with excitement to meet other wolves and wolf-dogs who were just like me! I was a little shy at first around my human caretakers but I got to know them very fast and they were so very nice. 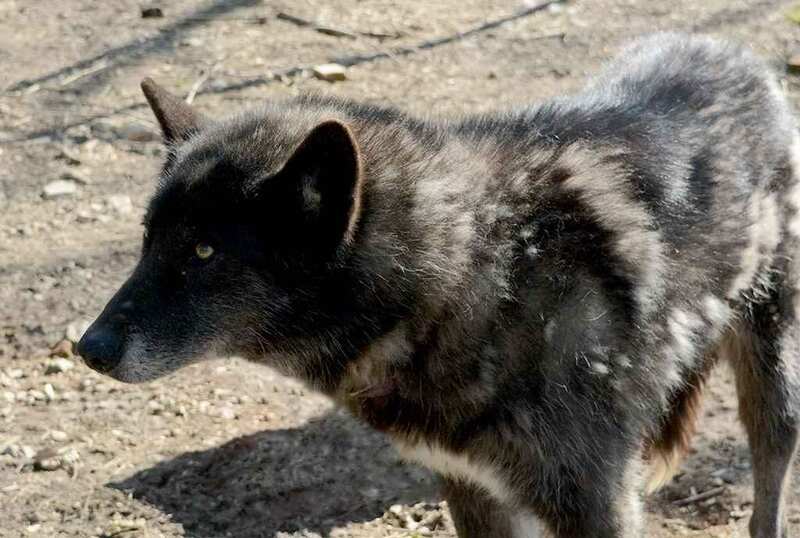 One day I got to meet a female wolf-dog named Cheyenne. She was so pretty and nice and she loves to play and run and jump and chase me and let me chase her. Now we play and pounce together all the time. Come visit us on a Private Tour soon! We will be watching for you! Hi Hi Hi! Ummmmmmm, I'm Little Joe! I am still a wee wolf but I am growing up quick and learning all the ways and wonders of the world! I was very very very scared growing up since I was shipped and bumped and shoved across the country all the way from Texas to Pittsburgh all alone but I finally have a forest home and a wonderful pack-mate named Nova to spend my days with! I am bit obsessed with being organized. I keep my territory tidy and I carefully arrange all of my treats and bones and sticks straight in a line on my platform. Come visit me on a Private Tour! I will see you, you may see me. The sight of people still makes me nervous. Hi there! I’m Nova! 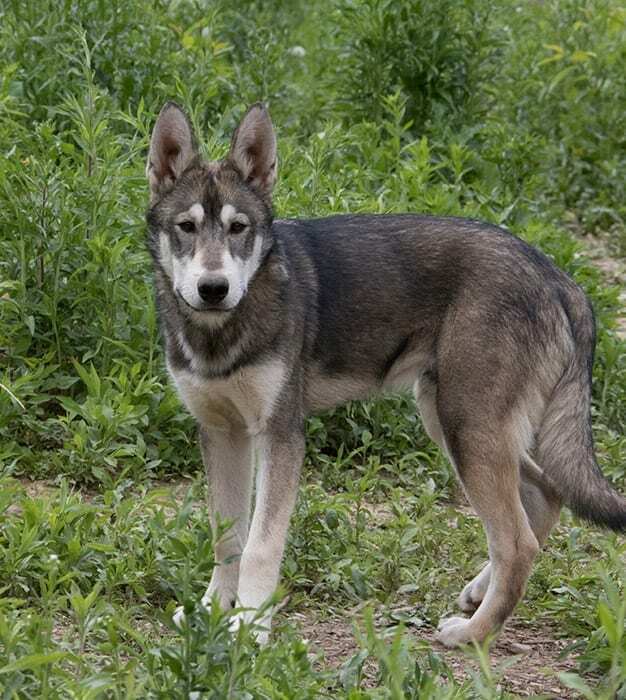 I am a female wolf-dog but don’t let my dainty size fool you – I am still a wolf at heart! When I was very little I remember being alone and very afraid and confused. I was not with my family long enough to learn trust or how to play. I felt very lost in a world of concrete and small spaces. When I arrived here there were birds chirping and leaves rustling and I even heard the howling of other wolves, just like me! Soon I got to have my very own territory just like I’d always dreamed! I have a very special wolf-dog friend now named Little Joe and he is teaching me how to play and have fun! I never had playmates before! Come visit me soon on a Private Tour! I will be watching for you!